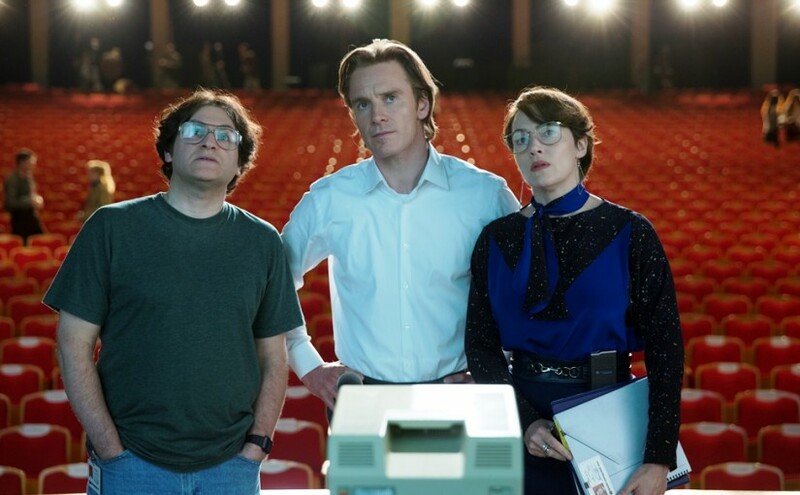 Perhaps the single most influential person on our current digital age, a cinematic treatment of Steve Jobs’ life was sure to follow his early passing from cancer in 2011 at only fifty-six. In fact, this is already the second attempt to dispel the myths and allege a ‘true’ account of his life on film. The first out of the blocks, 2013’s Jobs starring Ashton Kutcher, suffered from poor critical reception and rejection by his Apple associates. This former poor-performing venture, and the watchful eye of those close to the man himself, only heap extra pressure on Danny Boyle’s system reboot. A man with a fearsome reputation for ego-driven dictatorship and viewed in some quarters as the technological messiah should provide a rich standpoint from which to examine our burgeoning and rapidly expanding tech universe. Shouldn’t he? The job facing Boyle is ultimately to translate the conception and marketing of a new computer operating system into an engaging and exciting drama. It’s an ambitious program. Employing wordsmith Aaron Sorkin, the man who successfully converted the computer coded foundations of Facebook into the uniquely gripping and Oscar-winning thriller The Social Network (2010) brings on board the most appropriately qualified screenwriter to assist. Boyle’s familiar bold panache is present, but only fleetingly, mainly when the action skips forward in time to the next of the three product launches upon which the story hangs. Ingeniously, all the action takes place backstage, in the immediate run-up to these key announcements. Thus the drama takes place behind the curtain, against the backdrop of what is actually in front of the stage, namely the expectant and adoring crowds who fill the auditoria, unable to contain their giddy excitement. In trademark Sorkin style the movie revolves wholly around speech. Every utterance is rattled off, rapid-fire, rich, every scene comprising a two or three-handed dialogue. As a result the tone is deeply theatrical, emphasised by the canny inversion-of-stage set up. Fundamental plot points (Jobs’ and Steve Wozniak’s garage-bound inception of their early prototype, Jobs later being fired from the board) play out in similarly quick-fire flashbacks, induced by a moment of heightened anger, racing through the minds of the players, fuelling their passion. While Kutcher’s earlier portrayal was, in isolation, acclaimed, man of the moment Michael Fassbender’s dissimilarity to Jobs is problematic. We are constantly reminded that we are watching an actor at work, rather than simply accepting and investing in the character. That his personality was ‘difficult’ is depicted plainly, never sensationalised. The only themes to recur through all three acts are his denial of paternal responsibility and his refusal to acknowledge the team behind the Apple II, the computer that launched the company. Someone so driven, so convinced of his own radical vision at the expense of all others would never win friends easily. His relationship with Wozniak (Seth Rogen) slowly atrophies while Kate Winslet expertly relays the remarkable resilience of his persistently patient P.A. But the tone is never disapproving, and even ends on a note of (ambiguously presented) praise. What remains is a story that is interesting, but little more. Despite Boyle’s flamboyant touch, this is an inevitably dry affair. It always feels too script heavy, too lacking in action to win over the mainstream audience. But as I write this in a café dotted with the white luminescence of MacBooks and iPhones, the company that Jobs founded is by far the biggest global brand, dwarfing rivals Microsoft, Google and Facebook. How its uncompromising leading light laid the groundwork for that dominance feels an important story to tell. It opens with Jobs angrily demanding that the 1984 Macintosh says “hello”, a powerfully symbolic counteraction of the inherent and alienating coldness of technology. This need to make the high-tech world welcoming, user-friendly, compensated by cuddliness in order to win human acceptance has become the defining marketing style of our online era. Earlier advertising that aligned Jobs and his company with visionaries like Einstein, Picasso and Gandhi may seem arrogant with hindsight. But we all now live in the world that perhaps only Steve Jobs foresaw. This aloof, cold-blooded picture would seem to be a fitting portrait. Rather than a movie, I felt like I was watching a play adapted for the screen. The ‘behind the curtain’ action suggested this too.